Today is one of those days where we get a few driver releases, first with Nvidia's new GeForce 337.88 driver, and now with AMD's Catalyst 14.6 Beta. It'll come as no surprise that this driver is optimized for Watch Dogs, with AMD promising CrossFire support and single-card optimizations for a title littered with Nvidia technology. The Catalyst 14.6 Beta driver also contains optimizations for Murdered: Soul Suspect, which is an AMD showcase game set for release next week. There's also a few Mantle updates bundled into the driver, including multi-GPU Mantle support in Thief, as well as Mantle support on Enduro setups. But the big update in the Catalyst 14.6 Beta is new Eyefinity functionality, namely support for mixed-resolution set-ups. Previously, if you had mismatched monitors running in an Eyefinity configuration, all monitors had to run at the same resolution, and if the native resolutions didn't match you'd get a pretty bad image. This isn't the case when you're running the latest beta driver. Now you'll have the option to either use Fit or Expand mode to create a virtual Eyefinity desktop. 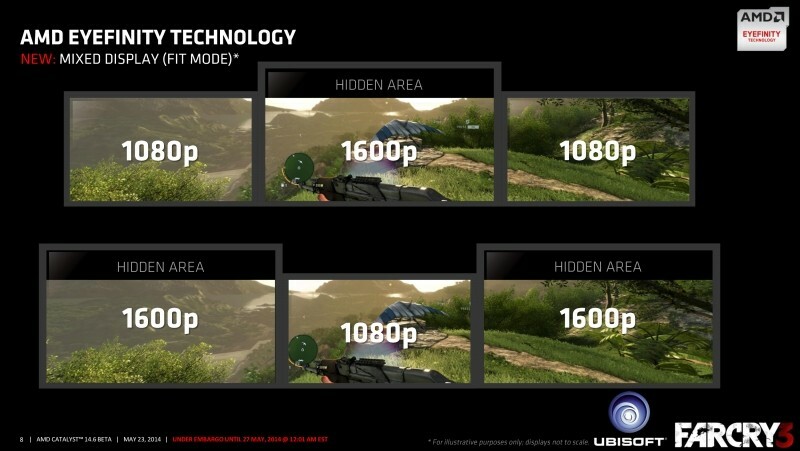 Fit mode is based on the smallest native resolution and creates a virtual desktop that crops out areas on monitors with a larger resolution; conversely, Expand takes the largest native resolution and creates a desktop that fills all monitors, but where some data is not shown at all. Whether you use Fit or Expand mode depends on the amount of resources you want to consume, with Expand being the more demanding option. The old method of having all monitors run at the same resolution is still available under Fill mode if you're used to the old way. Catalyst 14.6 also brings a range of new color management tools, including the ability to control boost and hue values per color, and an option for changing color depth that supports up to 10 bit per color if you have a compatible display.